You may remember our very blue bathroom...probably a styling thing 30 years ago when it was put in but definitely out-of-date now. I had great turmoil trying to find tile that "matched" and ended up with tile that "went together." I was dismayed to learn that when you find a tile you like it doesn't come in different sizes - this seems to me to defy all logic. If you are making a totally neutral or especially a colorful bathroom you would think a color would come in big floor tiles and matching small shower tiles with a shade lighter or darker of the same color for walls. This is not true. This is also why every one's bathrooms look kind of mismatched. So that was an eye opener. It was also a first for us to have someone else do work. 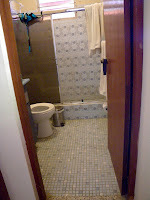 Well, the guys showed up on time, demolished the bathroom in 2 long days and took 4 days to reconstruct it. It was one guy for the demo and final day cleanup and 2 guys for tile installation. Then I primed the ceiling and walls and painted...found new soft towels before I decided on a wall color...and Jeff put the sink/mirror/vanity things up. 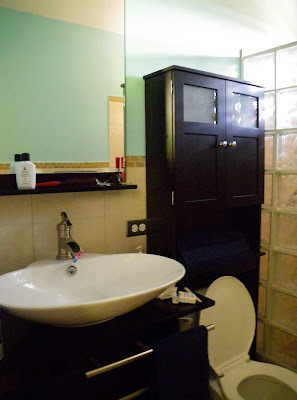 Here are some shots of the nice new bathroom! 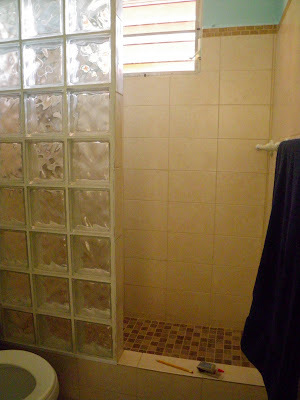 No more nasty sliding doors and no nasty shower curtain! Added storage and a vanity that hangs on the wall and has no legs to mop around. I am really happy with the glass block wall - no moving parts to rust or get gunky. I am happy with the color scheme. I am pleased to have a towel rack inside the shower to hang my drippy bathing suit on and finally have a large mirror that I can see my head in! The previous cabinet was replaced by a mirror long ago (a year after we got here because the mirror was the size of an envelope) but the new mirror reflects light and makes the room look a little bigger. The glass block wall was pretty interesting and easy to put in once you figured out the anchoring and reinforcing systems. I could have used rounded blocks for the edge, but with a small bathroom you look straight into I wanted to continue the straight lines and had them tile the edge of the blocks. I need to do a little smoothing with more glass block mortar or put a line of white silicone on it since the tile wasn't bull nosed but other than that am very pleased! What would I do differently? 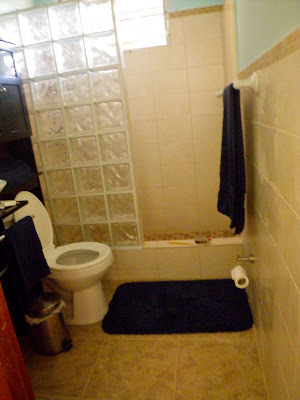 I used an 18 inch towel bar in the shower and a 24 inch one outside and would just go with two small ones. You can't fit two towels on the long bar so why not just have a small bar? I am getting used to the sit-on-top sink and may have mounted it a bit high - still getting used to it...it is a weird dimensional thing when you are used to things being flat. We need flatter doorknobs so the door will lay parallel with the wall. It didn't before but I never noticed it and now I'd like it flat (this is easy to fix- I am sure we can find flat levers here). I am getting used to the color I painted, kind of a turquoise, and it is ironic I ended up with a couple different blues in there after whining about blue blue blue... So the re-do was definitely worth it. I don't know how people deal with workers doing longer projects though - lots of dust and commotion and a definite disruption of routine. So what's the next project? I think we will take a breather and I may prime the ceilings and paint the walls a little lighter shade of the same color. I'll paint the ceiling white. I need to paint the wall down the driveway the same color as the house...the other bathroom should get done in a few months (gotta pay for this one first) and then there is the aquaponics project which is a big goal for the year. More on that one soon, like in the next post! Espero Volver de Cueva Perdida!